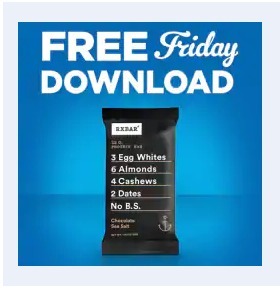 1 Free RXBAR Single (1.8 oz., select varieties) in Kroger stores, with coupon. This Kroger Free Friday Coupon is available for download on Friday, April 5, 2019 but you have until April 21, 2019 to redeem it. What is RXBAR Single? RXBAR Single is a protein bar made with 100% real ingredients – pure egg white protein and 100% natural chocolate – ready to give you a healthy choice of bar. Ingredients: Dates, Dried Egg Whites, Cashews, Almonds, Chocolate, Cocoa, Natural Flavours, Sea Salt. Allergens: Almonds, Cashews, Eggs. Manufactured in a facility that also processes peanuts, tree nuts, eggs, milk, soy and wheat. Redeem your coupon in-store within 2 weeks for 1 free RXBAR Single (1.8 oz., select varieties). Your coupon will automatically be applied at checkout when you use your Shopper’s Card. Available in most stores.